On these pages I will document my curly hair growth every three months using my routine of no heat and minimal hands on styling. 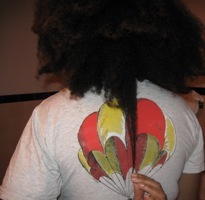 The history of this album is first, in March 2008, while my hair had grown quite long, it was severely damaged. So I decided that I would have my hair trimmed to armpit length and then again in May 2008 it was trimmed to collar bone length because I wanted it thicker. 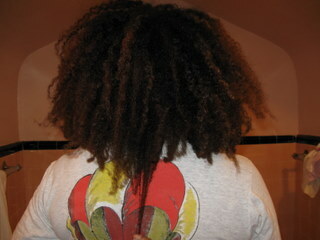 Here are pictures from October 2008 that show my current length. Is there too much shed hair in your comb? Read here to find out if that's normal. 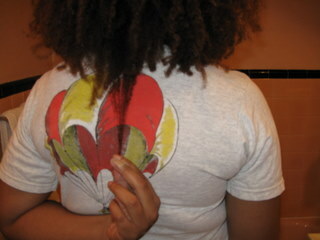 Okay, while I see some hair growth it's minimal because as you can see, there's a small tail of hair growth I'm holding. I feel like I'm stretching it for dear life. Yes, length is length, but I'd like the ends to be thicker. This is the type of slow growth that infuriates me! There appears to be about 3/4 to 1 inch of hair growth since January. For three months, that is really minimal. My hair grows super slow, but I won't complain. 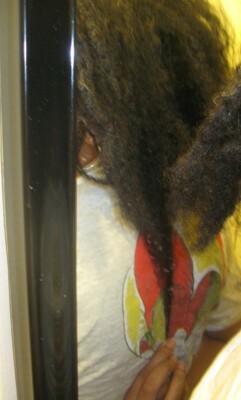 (Even though I just did) Oh well the next length check is in July. No growth! I can't believe it. There is no growth. 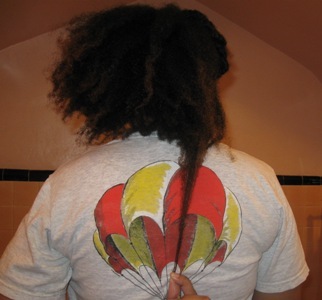 In three months, this particular area of my hair is not growing. So I may have reached my terminal length here. I don't know. I have to say I'm a little upset. Don't mind my hair. 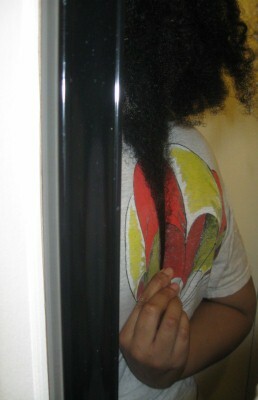 I wet it with a leave-in conditioner so it is undergoing severe shrinkage. Okay, I feel that the rest of my hair has filled out a little bit, because all of it is not the same length. However, the growth is extremely slow. My new hair idol is LongHairDontcare2011 on youtube. Her hair is just gorgeous!! So...one side of my hair has not caught up with the other side. Great! I think my hair is thicker. However, as far as length goes, it is at a stand still. Only time will tell. Now when I see this lack of growth, I start doing crazy things. Can you say pixie cut???? I would say in three months I have gained about a 1/4 of an inch on this side of my hair. My hair grows extremely slow and I think I've started to accept this pattern. So I think I will probaby achieve 3-4 inches in total growth this year. I realize that while a 1/2 inch per month (six inches a year) may be average growth, it's not my growth pattern so I have to adjust to what my hair will do. See, I'm getting better at making peace with my hair and being patient. I guess my hair is better on my head than on a hairstylist's floor. In the picture above, you can see the different length from the bottom picture. As I mentioned before, my hair is different lengths across my hair. I'm not trimming my hair because my hair is just going to grow unevenly. I do spot trims if I see split ends, but that's it. Now, since I wear my hair natural all of the time, I really don't need my hair to be even. So there is no real growth. I'm just going to be patient, because if I'm not then I get scissor happy and flat iron furious. I have 2 years...10 months...and 3 brain cells left until I apply heat again. UPDATE- 11/6/10- Because my hair does have a growth rate of 3-4 inches a year, I plan to measure my hair every 6 months instead of every 3 months. It is definitely more practical and less annoying this way. See, I have patience now. 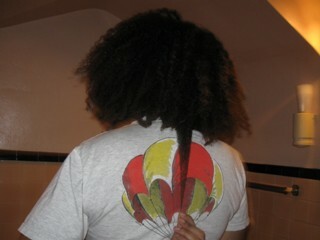 So the next curly hair growth pictures will be in January 2011. So, here are my growth pictures. 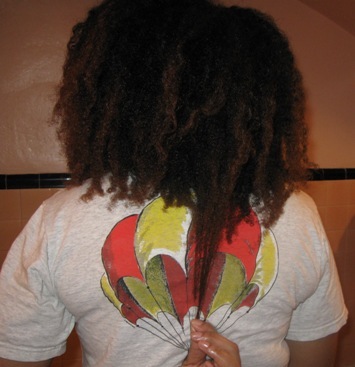 And, from the pics themselves, it seems that my hair didn't grow much, yet I also took measurements on October 18, 2010 and here were my results. 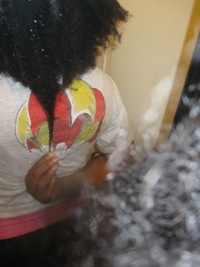 If I had not recorded the measurements in October, I really wouldn't have realized the growth my hair had experienced. I know this update is extremely late. I had to buy a new cable for my camera and believe it or not, for me, it took six months to do this. The picture above was taken at the beginning of August. Something else to notice: From October 2010 to August 2011 is about 10 months, almost a year. In the front, I only gained 1 inch of growth. In the middle, I gained 2 inches. On the left side, I gained 4 inches, and on the right side, there was no change. What's with that??? So, I don't know what is going on. But, it's good to have the numbers so I can assess and see where I need to go from here. Since my trim on November 5th, my numbers have changed so I will post them here soon. Thanks for coming back to read about the madness. Since August, I have gained .5 inches in the front. Yet that is not a surprise since the front of my hair grows faster than the rest for some reason. I lost 2.5 inches on the left side and 2 inches in back middle of my hair. And, on the right side (drumroll please), there was no change. Since that side of my hair seems to be falling out anyway. This is really discouraging. However, believe it or not my measurements from August, give me hope that if my hair could get to that length then, it could do it again. I have to persist and pursue the hair style that I want. So on to 2013, which will be the end of the five year hair growth/trim fiasco. So it seems like my hair has grown. Now I will let you in on why I think the growth occurred. I adjusted my routine, especially with the ends of my hair. While I spritz my hair with water still, I now dip my ends in castor oil and a bit of grapeseed oil and squeeze out the excess. 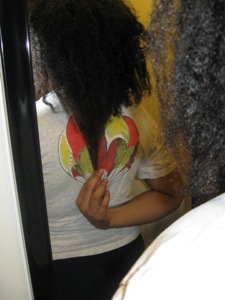 I do this whenever I feel that my ends are dry and crunchy. This may be everyday or every other day. This idea I got from Cipriana from urbanbushbabes. 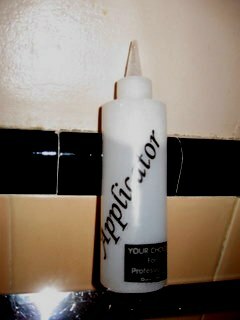 I also use her Love Potion #9 on my scalp. Check it out here. Additionally, I wear bangs now, but I wear my hair up in the back everyday. This has really contributed to the length. I've never experienced this kind of growth within two months, let alone six. So those small changes really made a difference. Would you believe that my hair still gets dry even in a protective style? Yet, that is my problem:Ultra dry hair. And, I realized that in the past, I wasn't faithful with moisturizing my hair with water, because I was stretching it and trying to keep it somewhat straighter and water shrinks my hair. 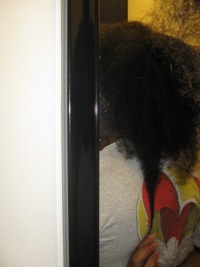 However the one thing that might kill a stretched hairstyle may be the answer to hair growth. So until I get to next year, I will continue this routine and spray my hair with water and seal it with an oil. So let's see what my hair does in June. On the other hand, the difference below between last year and this year is dismal, but that was due to my trimming setback. Who knows how long it could have been. So in a year I gained 2 inches in the front, 1 inch on the left, 2 inches in the back, and 0 inches on the right. 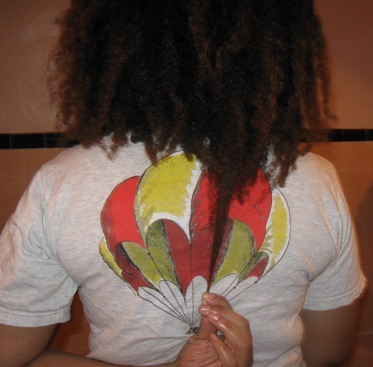 Find out what I learned during my last year on my journey toward curly hair growth. Weekly Shampoo/Detangling and Leave-in Conditioning: Updated 9/20/10 I've started to detangle way before I shampoo as a prepoo treatment with VO5 Moisture Milks and water in a spray bottle. Updated 12/21/10 I lightly detangle with my fingers only, separating my hair into four sections. 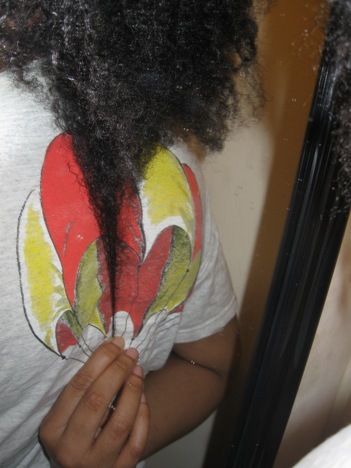 Read here about problems with detangling natural hair. Then I shampoo outside of the shower! Yes, outside of the shower with a cheapie shampoo! Then I wash it out in sections. I got this idea from Moptop Maven. On freshly washed hair, I apply shea butter, Oyin's whipped butter, or Oyin's burnt sugar pomade. 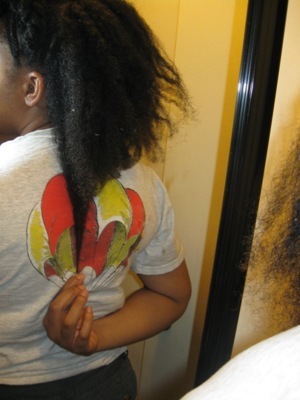 Then I will braid my hair into four braids to stretch out the hair and let it air dry. Then I realized that I had been scratching my neck a lot and it was red and seriously felt like it was on fire. That convinced me to stop using this product. This happened in August 2010. So I haven't used it since that time. Believe me, I don't know what particular ingredient caused it, but ingredients are really not a joke. Know what's in your products. Daily Maintenance: Updated 9/20/10 I moisturize my hair every night with water if it is dry. Since I applied a butter on my hair on wash day, I just spritz it with water if it gets dry since the butters are still on my hair.